OAE Off The Road Again, Springing Ahead. The Vernal Equinox snuck past in the dark of the last new moon. I missed it. I hope I don't miss the bus when she leaves on the next tour. The present plan--to depart El Doardo, Tonopah about 6th April and return five weeks later (mid May 2004) is wanting for $ome $upport and a few companions to make it most fun. The Cat Drag'd Inn can accommodate several 8-13 year-old unschoolers and it would be nice to have another sort of adult along to help with the mentoring and the housekeeping. Whinging-TV-addict-couch-potatoes need not apply (Unless they promise to leave their GameBoys at home). Prospective travellers should know how to play Cat's Cradle, wash dishes, like beans and peanut butter (but not necessarily in the same sandwich) and they should know how to read aloud and follow a roadmap. Prospective $pon$or$ need not have any of the above qualifications. So, gentle readers, here is your invitation: "Eccentric Outlaw available to mentor Unschooler Travellers on a voyage of discovery and adventure. If you are a small Human and would like to travel aboard The Cat Drag'd Inn on this upcoming tour, or, if you are an adult--but not yet a grown-up--and would like to travel with us or care to sponsor a student to travel in your stead, write me. Write now. Ian's 14th Birthday Suit Birthday Party. 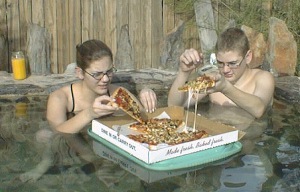 Floating Pizza in the Sunset Pool at El Dorado Hot Springs. The ice cream didn't fair quite so well. What's to be said about this? 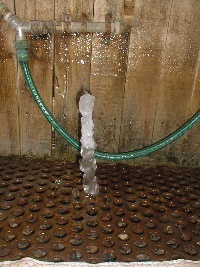 It was a cold night and the shower was dripping very slowly. Both of these pictures should have been in the previous letter but they are not entirely out of place here. My tomatoes have a head start. Two days ago I cut open a "tomato on the vine" for my lunch and several of the seeds were seen to be sprouting. Right inside the tomato, little sprouts with stems and two green leaves each! So I transfered five of them to my windowbox. Maybe I will have tomatos before my sister in New Hampster. Fifteen miles northwest, near a defunct windmill, there is a hill of volcanic bubble caves. 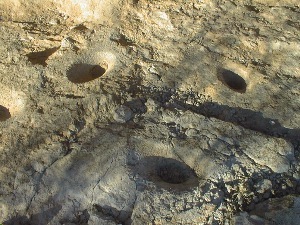 Inside one of them are several of the mortar holes--metates--as seen in the sandstone wind caves southwest of here in a spur of Saddle Mountain. Outside of another of these caves is a collection of pottery shards. One can stand in front of the largest cave and look back down the valley all the way to Tonopah and think about a former time when the climate was different and water flowed in the river whose dry bed meanders past. Words wheezed out through swollen bloodied lips. Tread uncut by cinders of Antarctic shore. If he has a serum that might cure this malady. Come back and I will give you one box more. For once the cap is off the muse is loose. I Survived Friday The Thirteenth! Busy weekend at Eldo. Bill said that it was the busiest business weekend ever. My days off. Ian had been here all week and we were finishing up projects so he could go home in the afternoon. 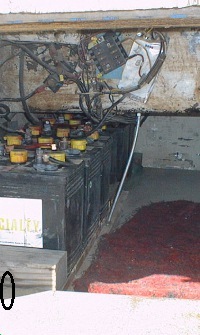 Saturday I pulled out the house battery bank for their annual inspection and cleaning. Everything there looks good except I've discovered a serious crack in the frame of the bellybox. Earlier last Summer I had bad feelings about that area and stopped in a wide spot to install a length of 3/8" all-thread and a few feet of channel iron to make a hanger and support the middle of the battery locker. The new found crack is going to require some professional help. Perhaps this will be the push I need to install a slide-out tray. There are six golf-cart batteries in the house set for a total of something on the order of 800 ampere hours. That's a lot of lead weight--390 pounds--not very well distributed. 2004 febter 25, Enough of Winter Yet? Have you had enough of Winter yet? I notice the humming birds have been packing their luggage and lining up to head north. But then two days ago it snowed in the mountains not too far north of here and all the hummers turned around for another sip at the feeders by the hot tub. We had a half an inch of rain in that same storm and some small hail. Noisy on the tin roof. Otherwise dry and warm between the thunderstorm cells and we had an Ice Cream Toss. Plenty of hot water and not much laundry. Getting ready for the Spring Equinox. I found Ethan's Suncharts again. At his page you can see the seasonal relationship between the times of sunrise and sunset at diverse locations on the globe. You can also construct a sunchart for your particular location. A few weeks ago I walked around the north peak of Saddle Mountain. Starting on the east side and going south, west, over the saddle, then north, and around that way to where I'd started--about five and a half miles. This time I started on the northwest corner and went the other way round. I don't know the names of all the passes and gullies so it is hard to relate the route. Up this gully, through that pass and down along a wash. I want to be here during the so-called Monsoon Season and see some of these washes full of water. Along the way up the west side of The Saddle there is a geocache that I have logged before so I stopped by to see if it was still there. 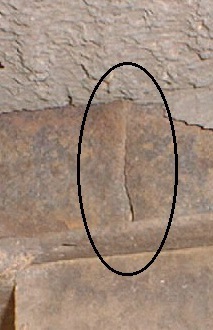 The good news is that it is still there. The not so good news is that nobody else has been there since the last time I visited a year ago. This cache is a little far out but not all that hard to get to. I've been admonished that one is not supposed to log a cache more than once however I think that once a year ought to be Ok, especially if nobody else is visiting it. Continuing my walk east, over The Saddle, past the Bighorn Sheep Water Catchment. On the top of another nameless spur I found something else. 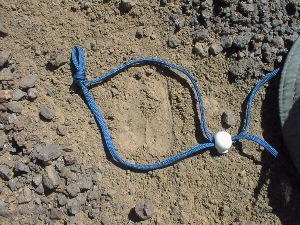 Sheep spoor! Since the last rain! I'm going to have to come out here again one day and sit still long enough to catch a glimpse of these animals. Fuel prices are up again. Well, everyone knows that. What I don't understand is how there can be so much of it and still the price goes up. I mean, back in the 1970's there was a Fuel Shortage. Long lines. I put two additional tanks into the old yellow van and on one tour we would spend entire days wandering from one gas queue to the next; a few gallons here, a few gallons there, until the tanks were full, the laundry dry and the shopping done, and then on the road for the next few days. But the prices stayed pretty much down where they had been before the "shortage". At least as I remember it. What am I missing in this picture? Were the prices then being controlled? Is the shortage now being contrived? Feast Day of Saint Patrick--What's That Green Glow over there? With the news in AridZona that the speed limit on certain sections of interstate will soon be raised to Ei8hty Miles per Hour I am suffering another bout of Future Shock. Raising the bar at one end will sooner or later raise the bar at the other end. Certainly, if most all the traffic is moving at 85-90 then the minimum safe speed will have to be higher to alleviate rear end collisions. Many truckers are applauding the news but half as many are not. They express concerns ranging from: The competition will be able to get more miles driven, and consequently more freight delivered, more money earned (are they paid by the ton/mile? ), than they cos some companies govern their trucks' speed; to: the same sort of concern I have about being over run by vehicles moving nearly or more than twice their own speed. Additionally, I have concerns about simply being legislated out of existence. It is time for me to renew my NH driver license. Can you believe it has been ten years since the last time? Perhaps now it is time I should seriously consider "moving" to AZ. That is fraught with peril since Phoenix inspects for emissions. The Cat Drag'd Inn is presently exempt but how much will I have to change my own diet? The prospects are scary to say the least. My easiest course of action is to renew with NH and think about it all for another ten years. Perhaps then it won't make any difference. Me'n'Ian watched Bowling for Columbine last night. Complex message there. Gun Control or Politician Control? Ian thought parts of it were funny; I am not sure which parts or whether he meant the content or the presentation. I thought the message was that we have a warlike country run by big business that spends billions of dollars inciting and then quelling rebellion around the world but does not understand the reasons why when the rebellion comes from frustration born of the hipocricy within government and business. Field Day 2004 June 25-26-27, Tonopah AridZona. Hosted by k1oIq, ka1fiy, and El Dorado Hot Springs.